Aside from your company website, social media content may be one of the most visible forms of content marketing that a brand can produce. When potential customers are seeking out information about your industry and your brand, they are most likely first visiting your website, then checking out your social channels. Content on social media allows you to open up a direct line of communication with customers, prospects and industry leaders in way that traditional media placements simply do not. Carefully crafted and curated social content can tell a customer what your brand is about, what kind of services you offer and even what kind of people work for your company. Consumers are coming to expect social content. Long gone are the days when social media channels can be ignored. Content marketing on social has become commonplace. Social Media Examiner’s 2014 Social Media Marketing Industry Report says that 92% of marketers have indicated that social media is important to their business. These marketers should be utilizing social media content to reach audiences specific to individual social media platforms as part of their overall content marketing strategy. Content that you develop specifically for your social media audiences on LinkedIn, Facebook, Twitter and elsewhere can have significant impact on your business when implemented thoughtfully and strategically. 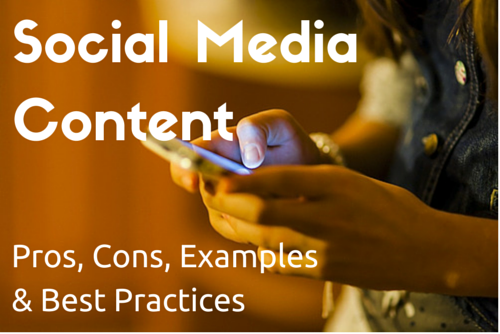 Social content can be shared more than once. Re-sharing a post to your blog just looks funny, but re-sharing content on social media is practically expected. You can repurpose with different images, different copy, and for multiple timezones. Comments left on Facebook, LinkedIn or retweets with questions can be responded to directly by a member of your team. This allows direct brand interaction with consumers. Social messages can be targeted to different audiences. Social content is sharable from consumer-to-consumer and grows organically from one trusted friend to another. Even in the most technical, dry b2b selling environment, social content allows you to humanize your brand. Additional reach costs money. Whether you’re boosting a Facebook post or sending out a promoted Tweet, social media sites have the edge up on reaching beyond your audience. Beyond organic sharing of content, only one rule applies: If you want more, you’ll have to pay. Measurable data from social content referrals often requires the creation of tracking URLs for individual campaigns. Perhaps the most recognizable example of social media content in the past year has been the ALS Ice Bucket Challenge. As social media users, our feeds were filled with short videos of friends and family members dumping ice water on their heads — and challenging others to do the same — all for a great cause. Social media was truly used as a driver in this campaign, even rallying support from celebrities and dignitaries. Companies like FedEx are leaving consumers with great pictures and short videos on Instagram. You might not think of your shipping company as a source of entertainment on Instagram, but the photos are beautiful and some of the behind-the-scenes videos are fascinating. We #DeliverJoy all over the world. Which #FedEx hub is closest to the North Pole? 1st right answer wins a Purple Hat! ‘Adweek’ named GoPro’s Facebook page the best brand page of 2014, and for good reason. The page’s 8 million + followers not only see examples of GoPro cameras catching amazing imagery, but many of the brand’s fans upload their own photos and video as well. Companies like GoPro are able to bring participation marketing to major heights without even having to ask for contributions. Be as human as possible. Even when your brand is in a serious, technically-robust industry. Don’t be afraid to back up your successful organic campaigns with a paid boost. Whether that is on Facebook, Twitter or an ad elsewhere, a paid campaign can help get your content beyond your existing audience. Take advantage of current events. We all know the Oreo story. Social media is ripe for newsjacking (jumping on current news topics to promote your brand), so be prepared to take advantage of major events if it fits your brand’s image. Always be thinking of quality. Almost every brand is on social media. Most of your competitors are, and they’re trying to get in front of your customers. Quality content will help you stand out. Just because social media posts sometimes have a short shelf life, doesn’t mean the content should be thrown together last minute. Social media content marketing has come a long way in the last few years. Brands have figured out how and when to find their audiences on social and they have built teams or hired agencies to help them engage with customers. While social media sites continually go the publisher route and make brands pay for targeted engagement, they simply can’t be ignored. Your content presence on social media is your way to put your best face forward and engage current and potential customers. Have you been successful using social media content in your marketing mix? What are your tips and tricks? We all know well, social media plays an important role for generating the traffic for any kind of website. But how social media content is helpful and what is it’s pors and cons, you have explained it well in this article in a simple manner. Thanks for educating us. Content is the king of the SEO. Very well written James, flawless explanation about Social media’s advantage and disadvantage. Also to add up here with the help of social media like facebook, twitter, and many other sites helps in advertising through the business cover page, tweets, posts and many other way which ultimate in boosting business at a global level. Thanks for the response. I think a lot of companies struggle with that ratio. There is definitely a balance between speaking to your customers about technical or product information as well as representing your company as a real group of humans behind the social channels. As the social media content manager of a micro business in Buffalo, NY we use social media every day to help market the business. Usually we try to post 3-5 articles, blog posts, etc. to all of our social media platforms posing questions in many of them to try and engage our audience. And so far it has worked! Great post, thanks for the advice, especially about taking advantage of current events. It has been an ongoing topic of discussion among the SCC team and your comments should help my side of the argument! Thanks, Daphne! Glad you liked the post. For social media, let me mention hashtags. Lots of good UGC can be found on Twitter or Instagram about a brand. To make the best of them, you can embed a social wall with your brand hashtag on your website. Regarding content, you can moderate and choose to display only the posts you approved.